We’ve tested five of the Ecosmart™ LED 60w A19 daylight white light bulbs in our apartment dining room chandelier, and if they last as long as CREE predicts that we’ve used for several years prior, they’ll pay for themselves at least ten times over by the time they reach end-of-life. We’ve run these for sixteen hours each day for a couple weeks now. This Ecosmart™ bulb has run throughout much of the day, with neither flicker nor failure, and cost us only $14 for an 8-pack at Home Depot last month. These LED bulbs operate with SOME heating. But they don’t become nearly as hot as their incandescent counterparts. They run even cooler than the compact fluorescent lamps, so popular in the last decade. Plus, they operate silently, with neither buzzing, humming, hissing, nor whistling. On radios, they’re also quite quiet; generating no detectable RF or EM interference on those most susceptible AM frequencies. Further, the common A19 form factor allows these economy LED bulbs to fit in virtually any light fixture that supports a standard incandescent bulb. The A19 bulb format resembles the traditional Edison-style incandescent bulb in size and shape. This LED bulb also about mirrors it in its low weight. Gone are those heavy metal heat sinks at the base of many older LEDs, that not only contributed to a significantly heavier unit, but also raised the shipping costs of the bulbs, due to the extra weight. These Echosmart™ units on the other hand, are quite light; not much heavier than a corresponding 60-watt incandescent lamp. So, they’re cheaper to ship, and this, among other factors, results in a much cheaper, state-of-the-art light for the consumer. Thumbs up to Ecosmart™! Ecosmart™ has made these LED bulbs significantly more affordable than the CREE models of past years, that we’ve sampled; currently about a sixth of the price per bulb. 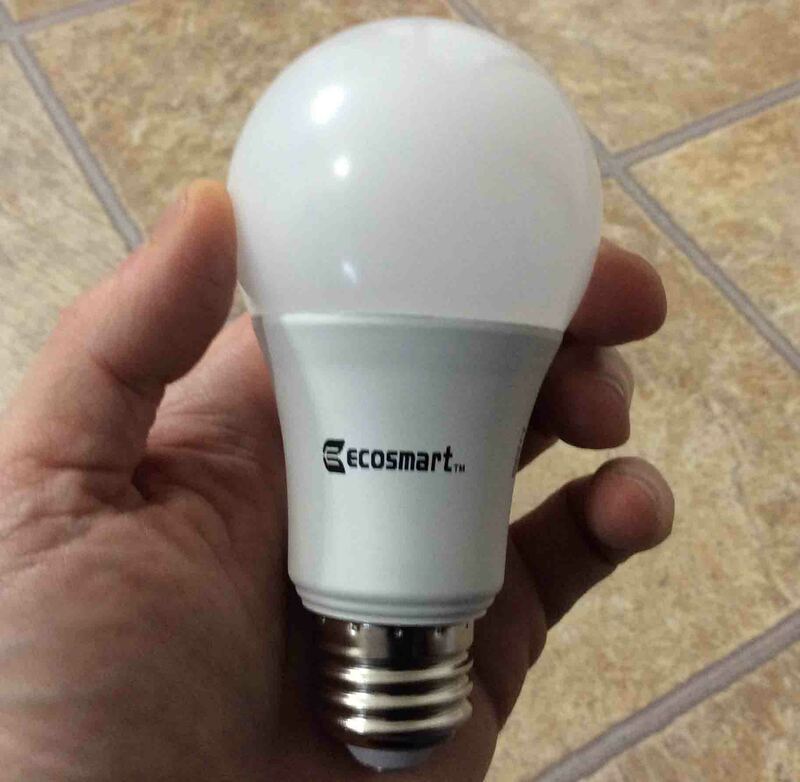 Ecosmart™ LED 60w A19 daylight white light bulb, held in hand. The most popular power size, 60w. These bulbs come in 60 watt incandescent equivalent output. Note that this rating IS NOT the amount of power that this LED bulb actually draws. Rather, it expresses the amount of incandescent lamp light output that you get with this bulb. At 840 lumens light output, this LED bulb, though producing 60 watts of equivalent incandescent light, actually only draws 9 watts. So, this bulb is much cheaper to operate than incandescents. Way more light per watt than incandescent bulbs. For this Ecosmart™ 9-watt bulb (840 lumens), you get slightly more light that what you’d see from a 60-watt incandescent light bulb (650 lumens). Yet you only pay for 9 watts draw! Cooler operation. With so much more of the consumed power going into actually producing useful light, and less to wasteful heat, LED bulbs radiate far less heat. Ecosmart™ bulbs therefore, can be up to 83 percent more efficient than incandescent bulbs. Longer life. They rate these at 15,000 hours average life expectancy. If operated for three hours each day, their projected useable lifespan is 13 years. No external heat sink. Less metal in these bulbs, owing to the greater efficiency electronics and LEDs themselves. This also makes handling them while hot much easier. No surface on this Ecosmart™ LED bulb ever gets so hot as to produce burns. Durable construction. Stands up well to shocks and drops. No warm-up time. You get full brightness almost instantly upon LED turn-on. Instant on, Instant off. Suitable for damp locations. Humidity will not destroy these bulbs. However, we suggest not getting them wet. Avoid direct rain exposure. Near flicker-free light. We detect no perceptible flickers, no matter the ambient room temperature. There are reduced brightness fluctuations noticed from things like refrigerators kicking on. The light output here remains constant through a wide range of input voltages. Full brightness, even in the cold. Like incandescent lighting, but not like compact fluorescent lamps, Ecosmart™ LED bulbs operate efficiently even in very cold temperatures. You get full luminosity even when the area being lit is freezing cold. Less light output degradation over time. As incandescent and CFL bulbs accrue more hours of operation, the internal filaments evaporate over that time, and the metal deposits itself on the inside of their glass envelopes. So, by the time the bulb burns out, its light output has significantly decreased due to the darkened glass that results from these metal deposits. However, these LED bulbs do not exhibit this source of light output reduction generally. They retain virtually all of their new-state brightness, even when they’ve neared end of life. Decent color rendition index (CRI). Ecosmart™ LED bulbs offer a CRI of 80. So, particularly the “daylight” models serve as acceptable photography lighting. We’ve taken all the pictures in this post using these as a light source. No detectable radio interference. We can find no carrier waves from these bulbs on the AM radio or other medium- and long-wave radio bands. Less dust accumulation. With the lower heat output of LEDs, these bulbs attract less dust and dirt, the fine dust particles that do accumulate, do not stick as much to these, as they did on incandescent bulbs. Omnidirectional. The radiation characteristics is very much like traditional incandescent lighting. These LED lamps spread light around in nearly equal amounts in all directions except for directly underneath the bulb, toward the socket. Frosted exterior. Softens shadows and helps spread the light more evenly. The bulb itself lights very uniformly; no dark or bright spots on the lighted globe surface. Inexpensive. Though these bulbs usually pay for themselves many times over throughout their entire lives, their initial cost of less than $2 per bulb, makes the initial investment in them even less than that of compact fluorescent lamps. Prices have fallen, with quantity deals like the 8-pac discussed here, have become widely available. Gone are the higher single-unit prices. Before too long, we expect home LED lamps to be cheaper than even the cheapest spiral fluorescent lamps. Fiveyear warranty. This is shorter than the CREE brand, which offers a ten year warranty. But still…, pretty darn good. 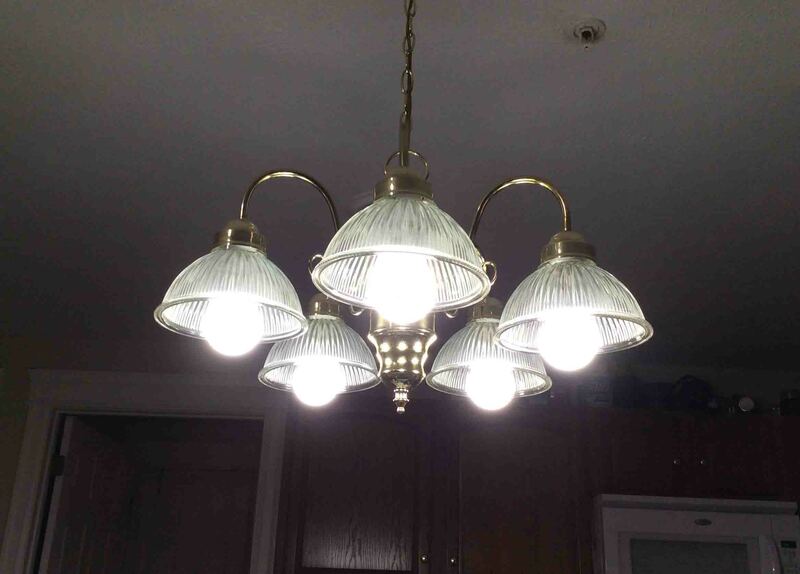 Five Ecosmart™ LED 60w A19 daylight white light bulbs, operating in dining room chandelier. Heavier than “Edison” light bulbs. Due to the internal support electronics, these bulbs might weight a little more than a traditional incandescent bulb. However, with the minimal heat sinking, the Ecosmart™ bulbs are not much heavier at all. Not Dimmable. This line of bulbs is not compatible with any light dimmers. Should not be just thrown out. These bulbs, due to the electronics they contain, should be properly recycled. Dispose of these just as you would any other electronic device. We’re pleased that Ecosmart™ has created a highly affordable yet highly energy efficient LED product. It’s now practical for the average consumer to go green, without having to rob the bank to do it. With the five year warranty, sub $2 price tag per unit, and shock-resistant construction, we’ve found this LED bulb highly durable. Given that warranty, we fear little over accidental failure due to excessive vibration, drops, and shocks. These LED bulbs provide a decently full, natural-looking daylight, in most situations. It’s pleasing to see LEDs finally reaching mainstream lighting markets (they sure took their time getting there). Ecosmart™ has done an outstanding job ushering this technology into mass consumer markets. They have convincing many, by offering such a great product, that it really is worth the cost to upgrade from filament- and fluorescent-based lights to LED. We’d therefore, rate the Ecosmart LED 60w A19 Daylight White Light Bulb at 99 out of 100. Excellent product.